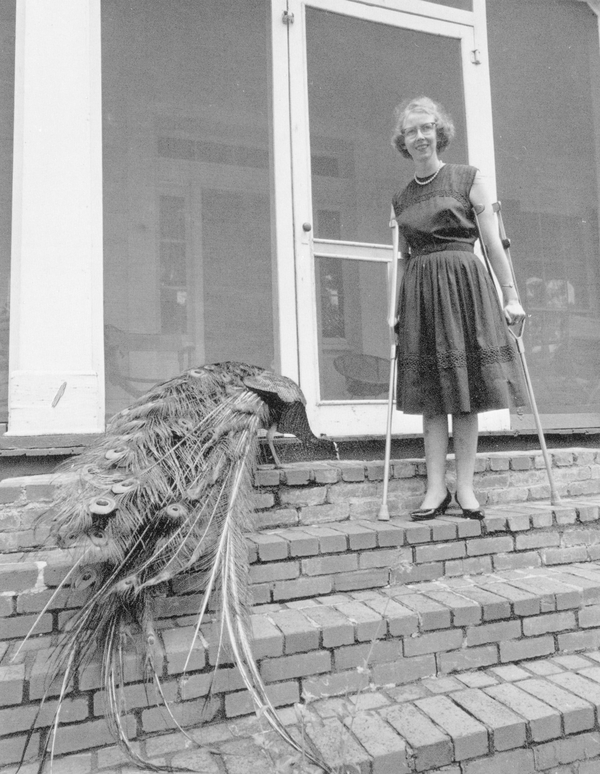 Flannery O’Connor was one of the handful of writers in the early 20th century who helped define the Southern Gothic genre. Her stories were centered in the American South, and often placed her misguided characters in dangerous situations. During her career, O’Connor wrote two novels, 32 short stories, and several reviews and social commentaries. She was undoubtedly one of the most prolific American writers of the early 20th century. Here, we examine the transformative moments in her life that drew her to help create the Southern Gothic genre of literature. O’Connor was born in Savannah, Georgia in 1925, and was the only child of Edward Francis O’Connor and Regina Cline. The family moved to Milledgeville, Georgia five years later. In 1937, tragedy struck when O’Connor’s father was diagnosed with lupus. He died in the winter of 1941. O’Connor and her mother remained in Milledgeville, where O’Connor attended high school, graduating in 1942. She was admitted to Georgia State College for Women, which she completed in 1945 with a degree in the social sciences. While attending college, O’Connor created cartoons for the student newspaper. Several modern critics believe these early drawings lent to O’Connor’s fictional stories later in life. She was accepted to the prestigious Iowa Writers’ Workshop in 1946. She initially attended to study journalism, but plans changed when she met several influential writers of the century, including Robert Penn Warren, John Crowe Ransom, Robie Macauley, and Andrew Lytle. Lytle, an editor at the Sewanee Review, published many of O’Connor’s first stories. After receiving her degree in 1947, O’Connor moved to Saratoga Springs, New York, where she lived with a community of artists and continued experimenting with her short stories. O’Connor once famously said that “anything that comes out of the South is going to be called grotesque by the Northern reader, unless it is grotesque, in which case it is going to be called realistic.” Most of her stories are centered on morally corrupt characters, and contain disturbing elements. She often confronts issues of race, disability, and religion. She was inspired by Thomism, a philosophical school that arose from Saint Thomas Aquinas. Her characters were notorious for undergoing massive changes. This was usually accomplished by placing them in a situations of increased violence or danger. When reading O’Connor’s works, one will notice a sardonic sense of humor. This was often done by inventing massive gaps between the character’s perceived reality, and whatever fate awaited them. She teased them for their inability to cope with the changes in race, poverty, and disabilities in 20th century America. O’Connor’s two novels, The Violent Bear It Away and Wise Blood, were accompanied by two enormously popular collections of short stories, A Good Man Is Hard to Find and Everything That Rises Must Converge. Many of the ideas O’Connor worked on within her stories emerged in her external life as well. She voted for John F. Kennedy in 1960, and was supportive of the Civil Rights Movement and Martin Luther King Jr. She traveled widely through the country, giving lectures on faith and literature. In 1972, her Complete Stories won the National Book Award for Fiction and a poll conducted in 2009 revealed readers felt it was the best book to ever win the award. A United States Postal Service stamp was created in her honor in 2015, and the University of Georgia Press created the Flannery O’Connor Award for Short Fiction to be awarded every year to a great collection of stories. O’Connor was diagnosed with lupus in 1952. She returned to her childhood home in Milledgeville and lived for another 12 years. Despite her failing condition, O’Connor continued to give lectures on her work. In these years, she completed over 20 short stories and two novels. She died at the age of 39 in 1964. She was buried at Memory Hill Cemetery in Milledgeville. Today, readers of O’Connor can visit her childhood home in Savannah, which has been transformed into a historic museum. They can also follow the Flannery O’Connor Book Trail, a series of Little Free Libraries that spans between O’Connor’s homes in Savannah and Milledgeville. As one of the leading writers in the Southern Gothic movement, O’Connor helped define an era of literature that remains much beloved today. Several decades later, her stories and characters continue to entertain and resonate with their dedicated readers.